Despite what the weather might be doing, summer is right around the corner and with it the start of the summer party season. Summer is a great time to gather all of your friends together, enjoy some sunshine, good food and drinks and reconnect with those we love. But sometimes we want to throw a big bash that really stands out, and for that, you need to pull out all the stops. At Monster Event Hire we are all about throwing fantastic parties, so here are a few of our top tips to wow our friends this summer. Anyone who has ever attended a summer party will usually say the same thing – they comprise of a barbecue, lots of drinks and some background music. And for some get togethers that is all you need. But for others, you need a bit of flare. 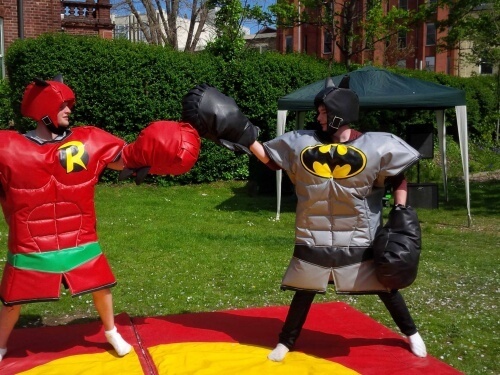 Our most popular summer event items are the assault courses, which lets all the adults let loose the child inside them and the kids just go wild! Some adults, more than the kids, love trying to beat each other across the course while other guests just enjoy the experience of making their way through an enclosed and open assault course. Also popular is the bungee trampoline or inflatable laser quest, all of which are guaranteed to make an impression with your guests. Who doesn’t like a good dance? From your 5-year-old niece to your dad, who can’t wait to show off his ‘dad dancing’ – music and dancing is a sure fire way to ensure laughter and fun. But for your guests who like a little competition (or structure) to their fun, there is the Dance Machine. Step up to the plate and strut your stuff against a rival and see who can impress the judges. Our stunning twin dance machine is a proven party favourite, and features current artists, classic disco tracks, dance, euro pop and much, much more. Fully equipped with metal dance mats, handrails, 42” plasma display and a powerful PA system, you will be transported back to the arcades of your youth with this summer party favourite. There are very few people in our society who don’t enjoy being in front of a camera, especially after they’ve had a few drinks. And while ‘party favours’ might seem a bit outdated, they don’t have to be bags of sweets like they were at our childhood birthday parties. Instead, why not have a photo booth set up at your party that allows your guests to dress up get silly and take home some photo reminders of the day? Our state of the art photo booths come equipped with state of the art green screen technology, so you can choose any background you like for your photos. They also come with a box of dressing up goodies for your guests to try out and photos can be printed instantly. You can even equip them with a video camera, so guests can leave you video messages. Of course, that’s just the tip of the iceberg. There are hundreds of different things you can do to make your summer party stand out, and there are lots of different options for different budgets. At Monster Event Hire, we specialise in helping people throw the best parties and events possible and we would love the chance to inspire you and your guests this year. For more information, or to book your summer party, get in touch with us today.